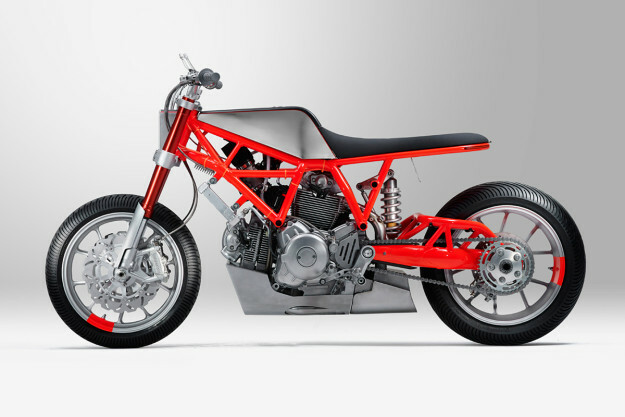 Last year, Ducati launched the ‘Custom Rumble’ contest. 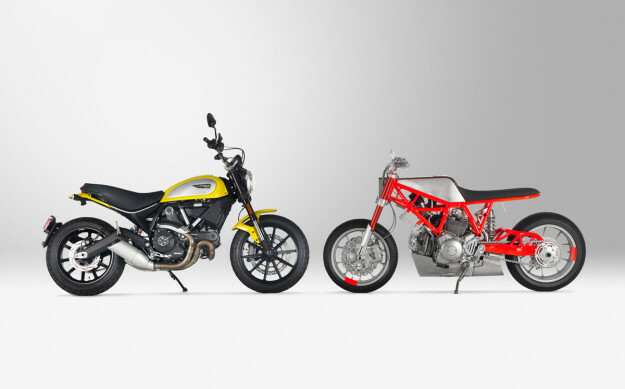 It’s a worldwide dealer build-off, based on the Ducati Scrambler, where the winner is chosen by public vote. 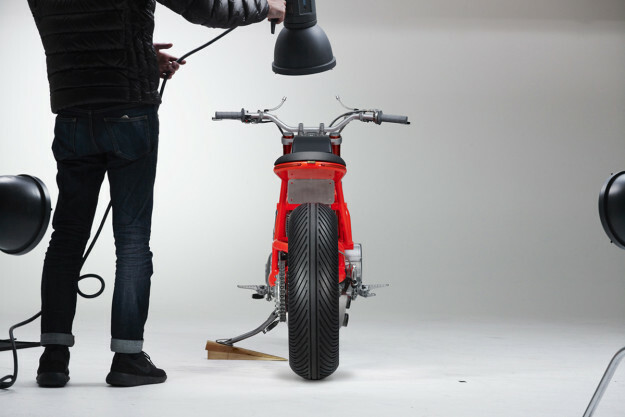 But how do you customize a bike that already has a trending look? The finalists have been chosen, and many entrants have visibly wrestled with that challenge. Not Marin Speed Shop though—they hooked up with Untitled Motorcycles of San Francisco, and threw the Scrambler styling rulebook out the window. 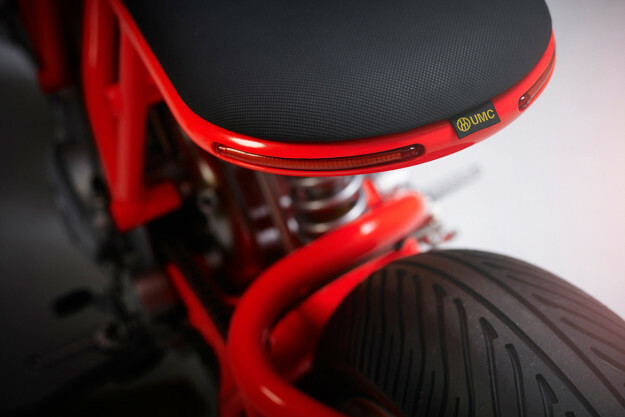 “The new Ducati Scrambler is a great platform,” says Untitled’s Hugo Eccles. “It does an admirable job of capturing the essence of the original Scrambler, but with certain inevitable cost and production compromises”. When Marin Speed Shop’s Jim MacLaughlin suggested they partner up, Hugo jumped at the opportunity to fix those compromises. “I love Ducati’s signature trellis frame on the Scrambler, and wanted to celebrate it,” he says. 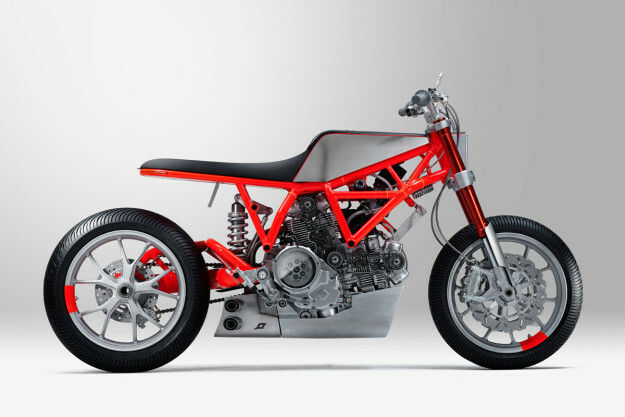 So he started by replacing the stock swingarm with a Ducati Monster S2R unit. Its tubular structure’s a much better match for the bike’s frame. A new subframe was needed to accommodate the S2R mono-shock—so the guys turned to a local fabricator, Turk’s Shop, to build one. The new front forks are Showa units from a Suzuki GSX-R, and the new 17-inch wheels are from a Monster M796 (front) and Monster 1100 (rear). Up top is a brand new steel fuel tank, hand-made by Untitled and designed to house the original fuel pump. Hugo went for a slim, tapered feel—creating a unified form from the aluminum headlight housing, through to the tank and minimal seat. The next phase of the Custom Rumble project saw the team strip all extraneous details and components, including two large tubs full of plastic bits. This resulted in a 85lbs weight saving; this Scrambler now weights in at 325lbs. 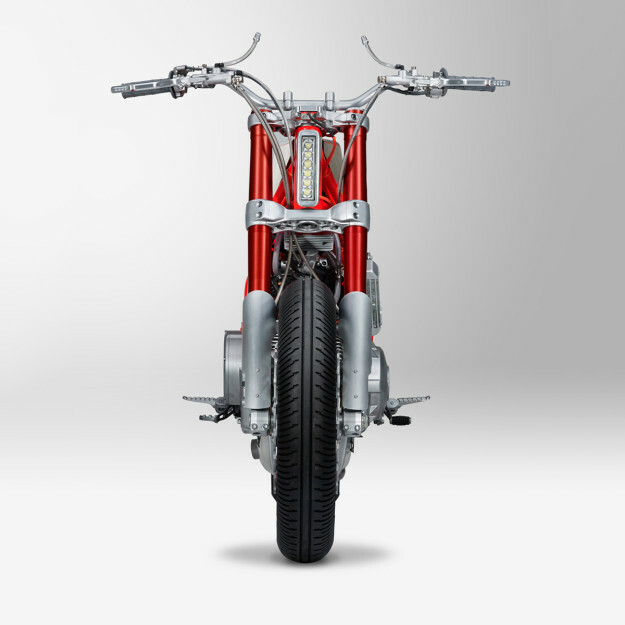 Visually, Untitled split the Scrambler into three elements: the engine, frame and body. 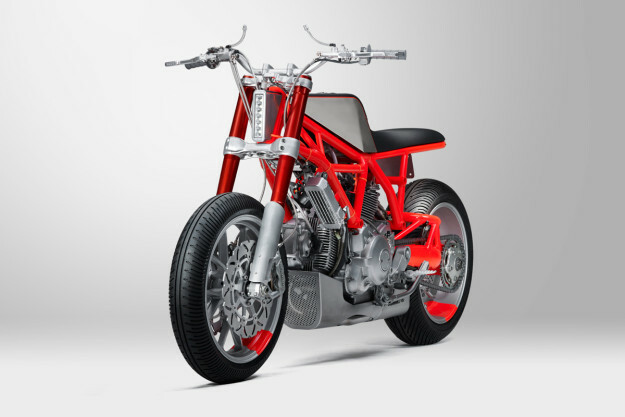 A ‘Rosso Corsa’ paint job helps the frame stand strong, with desaturated tones above and below. Even the engine’s had some serious treatment—stripped and vapor blasted for a raw, mechanical vibe. The point is driven home with details like the re-worked stator cover and exposed belts. 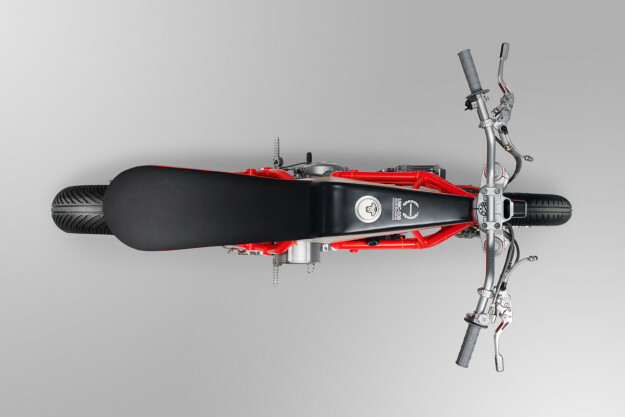 Drawing a line at the bottom is a custom-made belly pan, and a modified QD Exhaust Ex-Box system. The rest of the bike’s finishes are equally thoughtful. Twin LEDs in the rear loop act as both turn signals and a rear light, with LEDs embedded in the hand controls doing duty up front. And a tiny Motogadget LED speedo flows flawlessly off the top of the triple clamp. In fact, there’s hardly a joint, bracket or fastener in sight. Hugo makes no bones about the fact that the Custom Rumble build is a bit of a departure from Untitled’s usual style. Next versions? We like the sound of that. Original frame, de-tabbed, original shock mount removed. 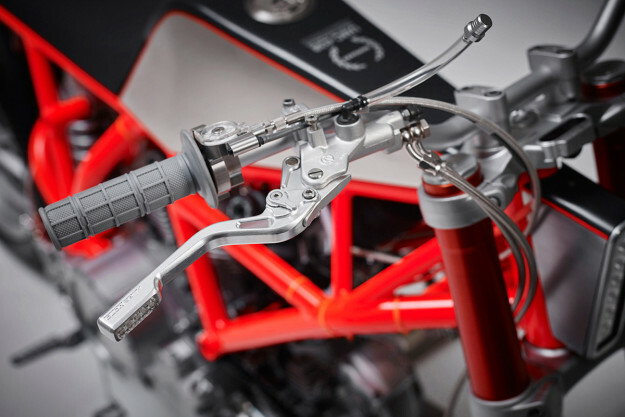 Ducati Monster S2R swingarm, Öhlins monoshock. New subframe with welded-in LED channels, fabricated by Turk’s Shop. Ducati ‘Rosso Corsa’ paint by Motojrefinish. Ducati Monster M796 17″ front wheel. 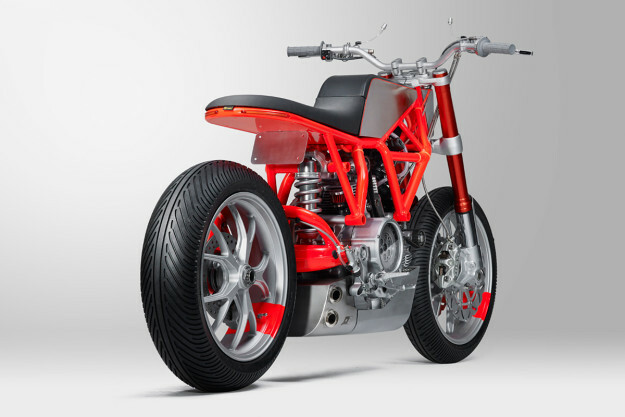 Ducati Monster 1100 17″ rear wheel. Continental RaceAttack Rain tyres (120/70-17 front, 180/55-17 rear). GSX-R Showa big piston forks, stripped and anodized to match the frame by Ano-Tech. 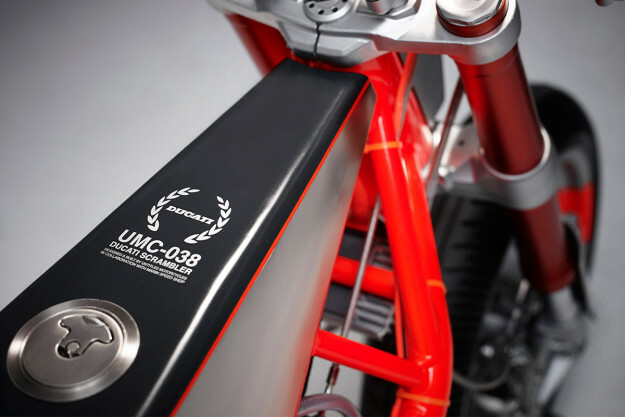 OEM foot pegs and levers, customised by UMC-SF. Custom fork guards, designed and fabricated in-house. Rear LED strips, integrated into the rear hoop, act as both brake lights and turn signals (Custom Dynamics). LED headlight, modified and machined in-house, mounted to a custom bracket welded to the headstock. Antigravity XPS SC-1 lithium battery installed under custom seat. Simplified loom, re-wrapped in neon orange fabric tape. Original ignition retained and relocated to right hand side of frame, under custom petrol tank. Motogadget motoscope mini speedometer and lights, machined into modified top fork bracket. Brembo brake master cylinder with 2-into-2 braided stainless steel lines. Brembo clutch master cylinder with braided stainless steel line. Custom throttle with braided stainless steel cable. 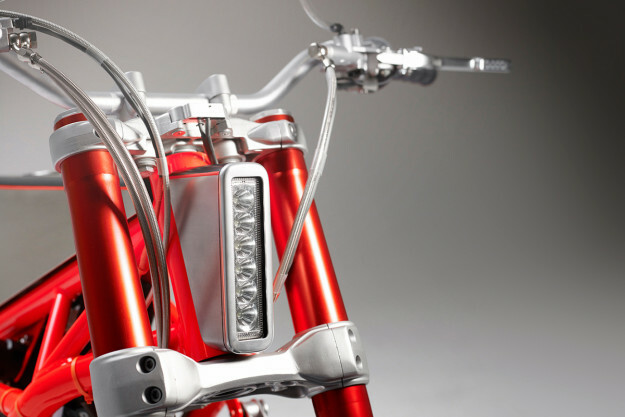 Custom levers, with integrated LED turn signals, by HugeMoto. Renthal low rise handlebar with custom switchgear. Original Bing throttle body retained, machined to accommodate air temperature sensor. Clear high-pressure braided fuel line by Helix Racing. Billet oil filler cap and sprocket cover by Slingshot Racing. Hydraulic clutch conversion, Ducati clutch slave with braided stainless steel line. Ducabike wet clutch cover with polycarbonate observation window, OEM clutch plates machined and finished. Original stator cover machined and modified by Turk’s Shop. Rear sprocket changed to 41-tooth to improve top-end speed. Custom-fabricated 10L steel petrol tank, original fuel pump, nickel plated and painted (range 95 miles, 115 miles on reserve). Aluminum headlight housing, brushed and polished in-house, 1300LM LED spotlight. Aluminum belly pan with mesh front panel and exhaust header cut-out detail by Nate Diepenbroek. Seat upholstered in motocross grip vinyl by Acker Leather Works.